Originally published by Reporterre. Edited machine translation by Enough is Enough. 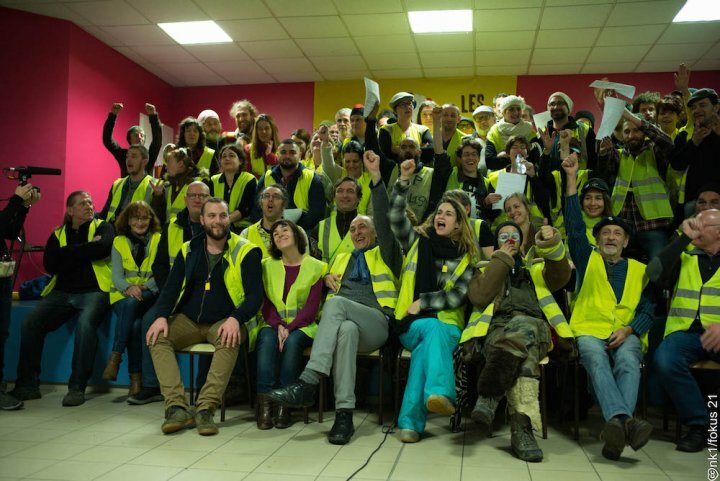 We, the Yellow Vests of the roundabouts, car parks, squares, assemblies and demonstrations, met on January 26 and 27 2019 in the “Assembly of Assemblies”, bringing together around a hundred delegations, responding to the call of the Gilets Jaunes de Commercy. Since November 17, from the smallest village, from the rural world to the biggest city, we have risen up against this deeply violent, unjust and intolerable society. We won’t let it happen again! We revolt against the high cost of living, precariousness and poverty. We want to live in dignity for our loved ones, our families and our children. 26 billionaires own as much as half of humanity, which is unacceptable. Let’s share the wealth and not the misery! Let’s put an end to social inequalities! We demand an immediate increase in wages, social minimum, benefits and pensions, the unconditional right for housing and health, education, free public services for all. It is for all these rights that we occupy roundabouts on a daily basis, that we organize actions, demonstrations and debates everywhere. With our yellow vests, we speak again, we, who never did. And what is the government’s response? Repression, contempt, denigration. Deaths and thousands of people injured, the massive use of weapons by tensed fire that mutilate, eviscerate, wound and traumatize. More than 1,000 people have been arbitrarily convicted and imprisoned. And now the new so-called “anti-cracker” law is simply there to prevent us from demonstrating. We condemn all violence against demonstrators, whether from the police or from small violent groups. None of this will stop us! To demonstrate is a fundamental right. End the impunity for law enforcement! Amnesty for all victims of repression! And what a sham is this great national debate, which is in fact a communication campaign of the government, which instrumentalizes our will to debate and decide! True democracy is being practiced in our assemblies, on our roundabouts, it is neither on TV sets nor in the pseudo round tables organised by Macron. After insulting us and calling us less than nothing, he now presents us as a fascinating and xenophobic hate crowd. But we are the very opposite: neither racist, sexist nor homophobic, we are proud to be together with our differences to build a society of solidarity. We are proud on the diversity of our discussions, even as we speak, hundreds of assemblies are developing and proposing their own demands. They concern real democracy, social justice and tax justice, working conditions, ecological- and climate justice, and to end discrimination. Among the most debated strategic demands and proposals are: the eradication of poverty in all its forms, the transformation of institutions (RIC, voters, an end to the privileges of elected representatives…), ecological transition (fuel poverty, industrial pollution…), equality and consideration of all people regardless of their nationality (people with disabilities, gender equality, an end to the abandonment of working class neighbourhoods, the rural world and other seas…). We, Yellow Vests, invite everyone to join us with their own resources. We call for the continuation of acts (act 12 against police violence in front of police stations, acts 13, 14…), for the continuation of roundabout occupations and the blocking of the economy, for the construction of a massive and renewable strike from February 5. We call for the formation of committees in workplaces, schools and universities and everywhere else so that this strike can be built on grassroots level by the strikers themselves. Let’s take charge of our business! Don’t be alone, join us! We propose to all Yellow Vests to circulate this call. If this call, as a yellow vest group, suits you, send your signature to Commercy (assembleedesassemblees@gmail.com). Feel free to discuss and formulate proposals for the next “Assemblies of Assemblies”, which we are already preparing. Call proposed by the Assembly of Commercy Assemblies. It will be proposed for adoption in each of the local assemblies.